There are at least a few in every college dorm: students who seem to exist in their own time zone, in bed hours before everyone else and awake again at daybreak, rested and prepared for the morning's first lecture. It's no surprise that poor sleep habits may negatively impact academic performance  anyone who's been exhausted enough to doze off during class knows that's detrimental to learning. And dozens of studies have linked an increase in nightly sleep to better cognition and alertness. The new research, however, goes a step further, quantifying the impact of erratic or inadequate sleep on grades. "These findings are more tangible than saying that if you get more sleep, you'll feel better," says Jennifer Cousins, a fellow at the University of Pittsburgh and author of one of the studies. "They connect sleep and how you sleep to the real world of daily activities." In the study of night owls, psychologist Jennifer Peszka asked a group of 89 incoming Hendrix College freshmen ages 17 to 20 to fill out a questionnaire about their sleep preferences prior to arriving on campus. Regardless of how much they actually slept, Peszka asked them whether they considered themselves owls, larks or, in the case of those who were neither very late or very early sleepers, robins. Students also answered questions about their sleep "hygiene"  factors that contribute to quality of sleep, such as adhering to a regular bedtime, waking up at the same time every day, or exercising or drinking caffeine before trying to sleep. One year, Peszka asked the same students to fill out another similar questionnaire to determine whether their sleep schedules were associated with GPA. The study did not delve into the details of why owls may perform worse in school, but Peszka suspects it may boil down to "an owl living a lark's schedule." Students with late bedtimes still end up taking early morning classes, which means they often end up feeling sleepier and less alert during the day. 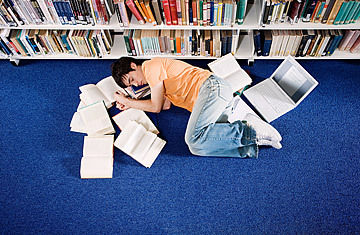 In fact, in Peszka's study, night owls slept 41 minutes less each night than the other students, but were still attending early classes, during which they reported sleepiness and inability to concentrate, which, unsurprisingly, led to lower scores at exam time. That's precisely what University of Pittsburgh researchers found in their study of 56 teens ages 14 to 18. Jennifer Cousins, a postdoctoral fellow in psychiatry, asked the adolescents to fill out sleep diaries for one week and wear a special activity monitor on their wrist, which recorded when the students were asleep or awake. Overall, teens with poor sleep habits  those who woke up frequently during the night, spent more hours in bed (whether or not they were sleeping) and reported feeling tired in the morning  received lower grades than students who stuck with a more regular sleep routine. Interestingly, Cousins also found that different sleep habits had different effects on the student's school performance: those who woke up more often during the night and reported poorer sleep quality did worse in math, for example, while those who slumbered peacefully through the night tended to get better grades in English. "These findings bring up new questions about teasing out the specifics of what is important about sleep that impacts learning," says Cousins. "Does sleeping more help our ability to deal with abstract concepts found in math, or does sleep quality increase creativity? We don't know the answers, and don't want to draw those conclusions yet. But this helps us understand more about how sleep helps the things we do in daily life." Both groups of researchers are quick to point out that academic performance is the product of many different factors  from I.Q. to study habits and effort, and not just sleep  but the new findings suggest that catching good quality z's certainly doesn't hurt, and may even help boost your GPA.